LOVELAND is a video installation by the Canadian artist Charles Stankievech, which features a Purple Cloud flowing over the frozen Arctic Ocean generating a performative act by the artist. 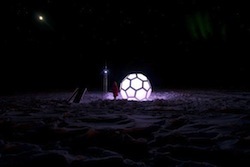 The audio in the video is a surround sound mix by Stankievech, which includes field recordings he did on the Arctic Ocean from the electromagnetic, acoustic and ice fields. Jordy Walker’s at minus thirty-five the speed of sound is 310.5 metres per second is an ambient sound collage from Whitehorse, Yukon. The air at minus thirty-five also feels incredibly present - you can never forget about the air around you the way you can at fifteen or twenty above. In this piece I wanted to reflect that idea sonically - to express the oppressiveness of the air at this temperature (when in actuality, the natural soundscape at this time of year is often quite still and soft). 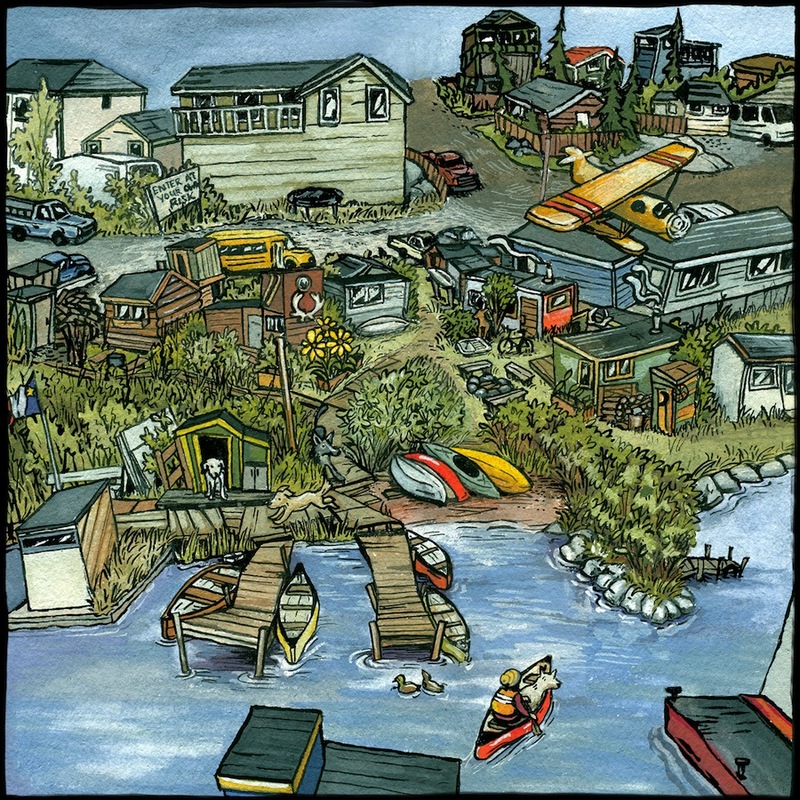 Pat Braden is a well known musician and storyteller in Yellowknife. 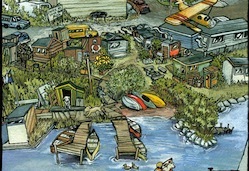 This excerpt from a 72-minute storytelling/musical theatre piece is about his life in the vibrant historical neighourborhood of shacks and rough and ready characters, Old Town. Heart is a sound piece created for Chetwnd's exhibition splitting (the) difference. Chetwynd’s interdisciplinary practice investigates how northern culture embraces the collective concept of 'the commons', where knowledge is uttered by interconnectivity to people, objects, and environment rather than simplistic hierarchy. I have collected the heartbeats and body sounds through a stethoscope microphone (this device can record the faint sound of blood, bones, lungs etc...) of those with whom I have an intimate relationship. These sounds were then layered together and form a unifying beat--where sounds and silent pauses lap and run over each other, sometimes in harmony, sometimes at odds. 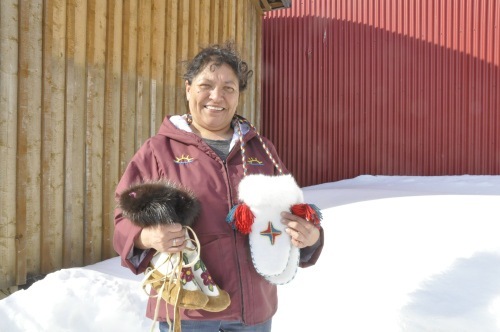 Interspersed throughout the show is Wanda Macleod’s noon hour call in show on CBC North, Northwind. Everyone loves Wanda. Radio producer and film-maker Marc Winkler gets out on the land and creates documentaries like Tundra Cowboy, a story about a reindeer herder. Marc’s sound piece of a goose hunt in Sach’s Harbour is featured in Distant Transmission. Travis Mercredi performs Traces of Touch, a playful and raw exploration of closeness. Mercredi, a Métis musician and sound designer born and raised in Northwest Territories, is also the co-produce and director of radio play, I Count Myself Among Them. The radio play is included in Distant Transmission in its entirety (49:30). It was co-produced and directed by Reneltta Arluk, an Inuk/Gwich’in/Chipewyan-Cree actor, playwright and producer. Carmen Braden shares her love of listening to and recording ice in Groove Ickkle and Lady Under The Ice. Her creative research has examined natural sonic phenomena, rhythms and harmonies, and draws on a life-time of aesthetic observations in the Canadian sub-Arctic. Carmen’s thesis work focuses on using the sounds of ice on Great Slave Lake in vocal, instrumental, and electroacoustic music. Emotive Ascension uses found objects, natural materials and experimental effects and heavy modulation to explore chaos and harmony. Inspired by history, culture, and their interactions with the human world and technology, Casey Koyczan’s work seeks to bridge the gap between visual and audio interpretations of art, while pushing the recognition for aboriginal values and politics. The Dew Project is a site-specific installation on the bank of the Yukon River, outside of Dawson City, Yukon. A border is not a connection but an interval of resonance, and such gaps abound in the Land of the DEW Line. The DEW Line itself, the Distant Early Warning radar system installed by the United States in the Canadian North to keep this continent in touch with Russia, points up a major Canadian role in the twentieth century, the role of hidden ground for big powers. Since the United States has become a world environment, Canada has become the anti-environment that renders the United States more acceptable and intelligible to many small countries of the world; anti-environments are indispensable for making an environment understandable. The DEW project revisits the issue of boundaries—both in regards to the environment and sovereignty while observing how communication technology plays a pivotal role in the definition and delivery of such ideologies.